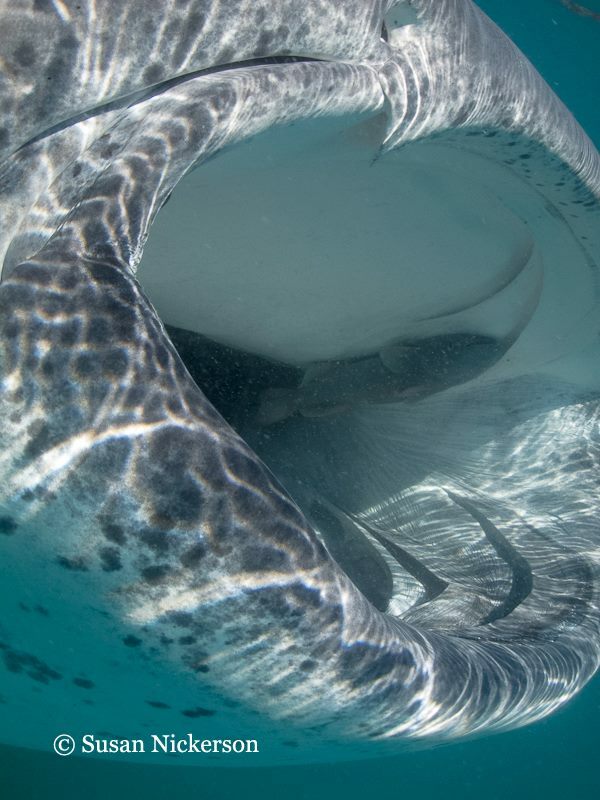 This year's Sea of Cortez workshop was full of photographers seeking out Whale Sharks, Sperm Whales, Sea lions, and whatever other surprises the Sea of Cortez brough. The trip began in Phoenix, Arizona. We met up with the "Head Out to Rocky Point" crew at the airport, where they picked us up in two passenger vans and two enclosed trailers to hold all our gear. Imagine just how much gear close to 20 scuba divers bring with them, add all their camera gear on top of that, and you'll have a good idea of why they needed two trailers. It didn't take long for our adventure to begin. Soon after crossing the boarder into Mexico, a bridge remodel forced us to take a detour through a small river. What is it they say about not crossing running water? 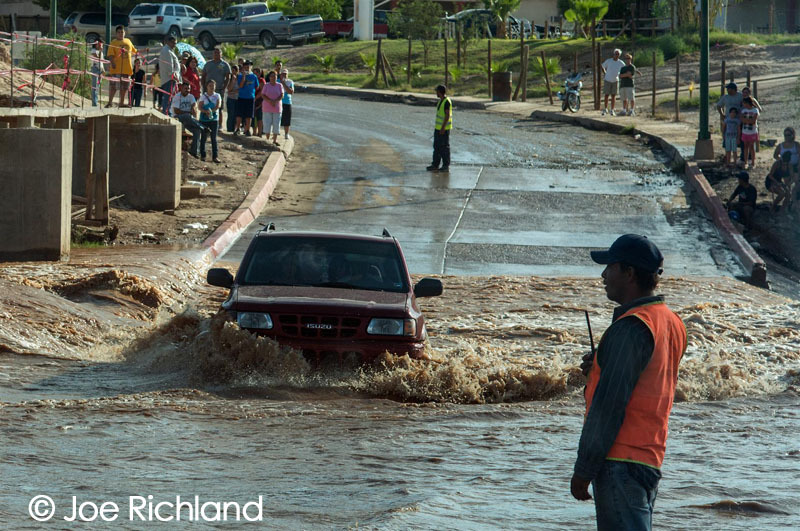 (see picture) It was good we had experienced drivers because I wouldn't have driven my truck through that river. We continued on to Puerto Penasco, where we boarded the Rocio Del Mar. 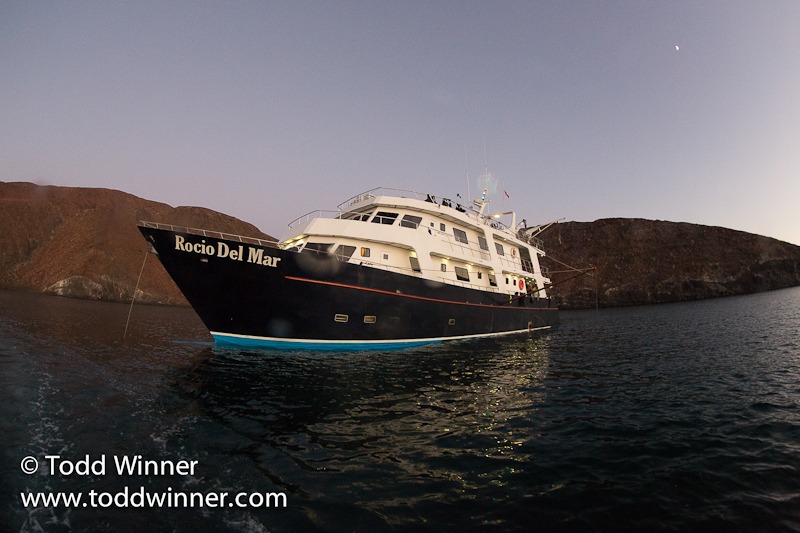 The Rocio Del Mar is a comfy 110ft ship built for diving, but it soon became apparent that they never planned for this many cameras at one time. We had over 20 underwater cameras on board with a mix of DSLR mirrorless and compacts. We even had 3 housed Canon 5D Mark III's! To create more space, we converted a large area of unused dive stations into a second camera table. The crew found us a large rubber mat to keep anything from sliding off and it worked out great. Now we were all set for diving *and* underwater photography. There are 10 cabins located on the mid and upper decks. The cabins are comfortable and all have private baths. However, some of the bunks were a little short for the taller guests. If you are tall make sure you get checked into a longer bunk. There was always plenty to eat with 3 meals and snacks in-between. The meals were a combination of Mexican and American cuisine. I especially enjoyed the fresh salsa! Most meals were served in the dining area down on the lower deck, but the last night we enjoyed a fiesta on the upper sun deck. After everything was stowed away, it was time to go looking for big animals. Everyone was very interested is seeing sperm whales, so we first headed south down to a location known for them and hit a few dive sites along the way. Our first dive was a check-out dive and I wasn't expecting much. 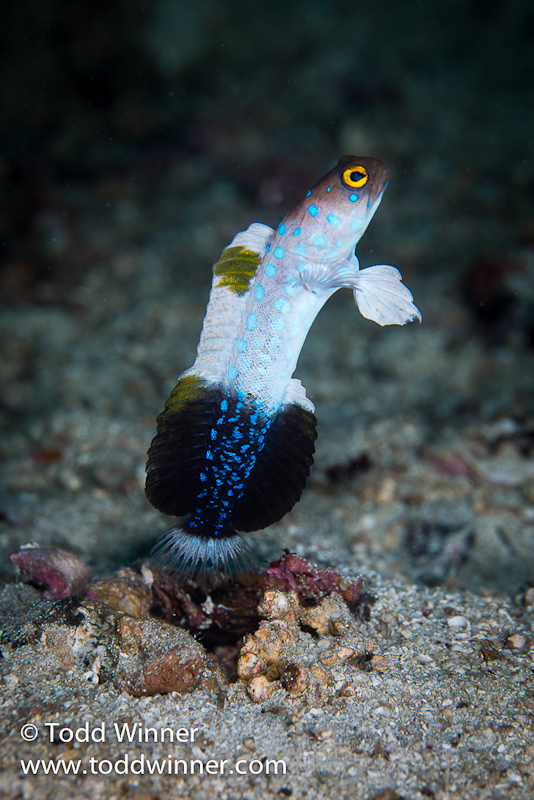 When we first hopped in, visibility was only around 30ft, but when I got down to the sand I saw jaw fish and pike blennies everywhere. 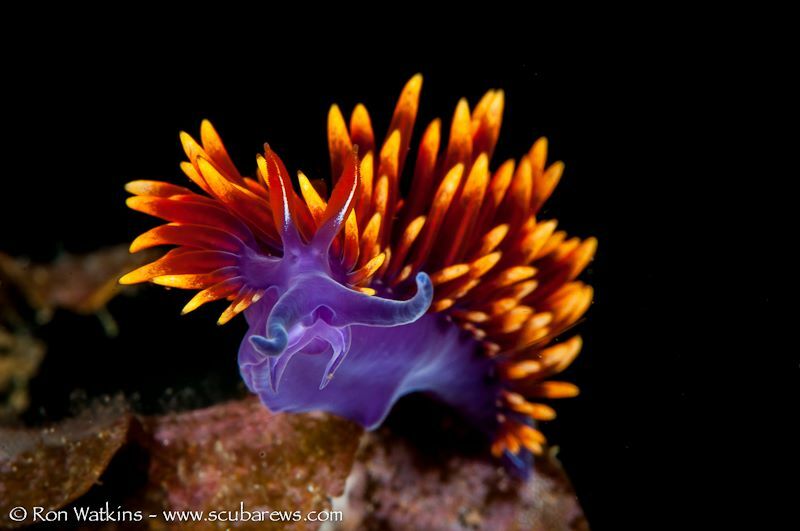 Suddenly, my so-so dive was becoming spectacular! 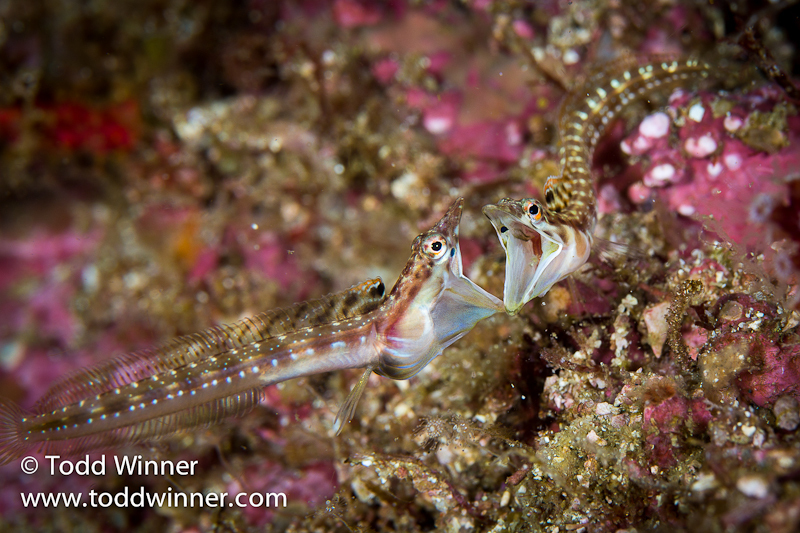 I've never seen so many pike blennies out of their holes and sparing for dominance. For our second and third dive, we hit a couple of sea lion rookeries. Like most rookeries, we had some playful juveniles and females, but the most interesting part of the sea lions on this trip for me was the large male bulls. Every rookery we dove at had bull sea lions patrolling their areas. They swim back and forth, barking constantly underwater. Often their areas were so close together that they overlapped a bit. Bull Sea Lions are very territorial and will fight to protect their space. Some of us even got to witness three bulls battling it out underwater. Talk about exciting! I've seen bulls clashing on land, but had no idea this occurred underwater. Even though the bulls were doing their best to scare us away by charging and barking in our faces, that did not stop us from getting amazing shots. We spent a good portion of the next two days looking for sperm whales. We spotted pilot whales, dolphins and even a few sperm whales from the surface. We made a number of jumps in the water with them, but none were very interested in playing with us. We had a few fly bys. and most of us got a chance to see both the dolphins and pilot whales underwater but no incredible photo opportunities. Unfortunately, this some times happens in wildlife photography, but this did not stop us from letting a good photo opportunity pass us by. 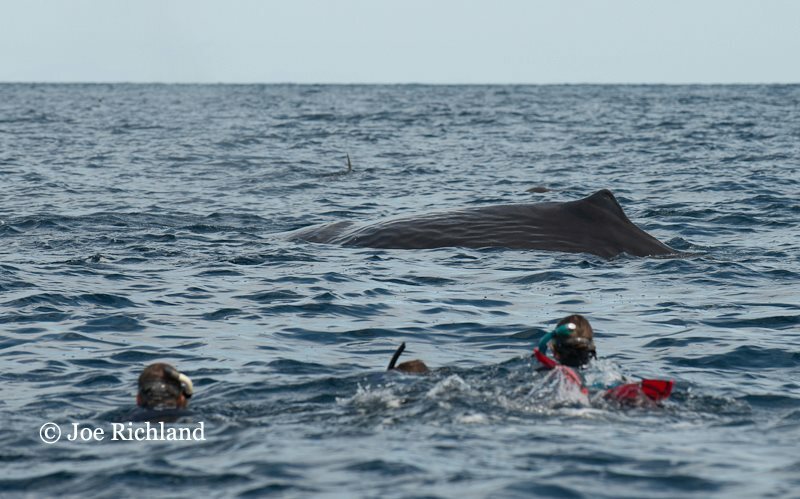 Many guests did see the Pilot whales underwater, but they would quickly exit the scene. At one point from the boat we saw thousands of dolphins - more than anyone has ever seen before. 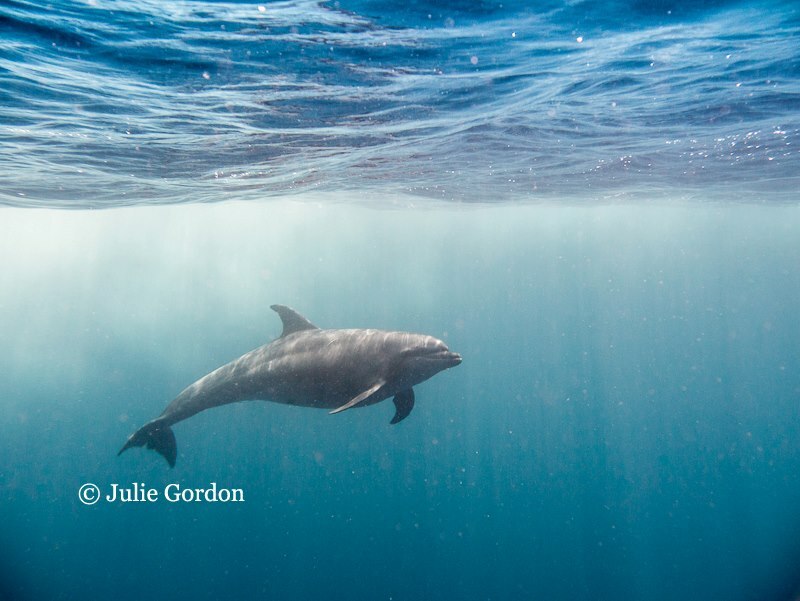 They were everywhere - the boat slowed down and for 20 minutes we were surrounded in every direction by dolphins. Some of started shooting the brown footed boobies that were landing in the water near us. They would stick their heads underwater as we approached them and this soon became a game to see how close you could get to one. This turned out to be a lot of fun and we came away with some great images. With the sperm and pilot whales not cooperating, we headed off to go dive a few more sites. 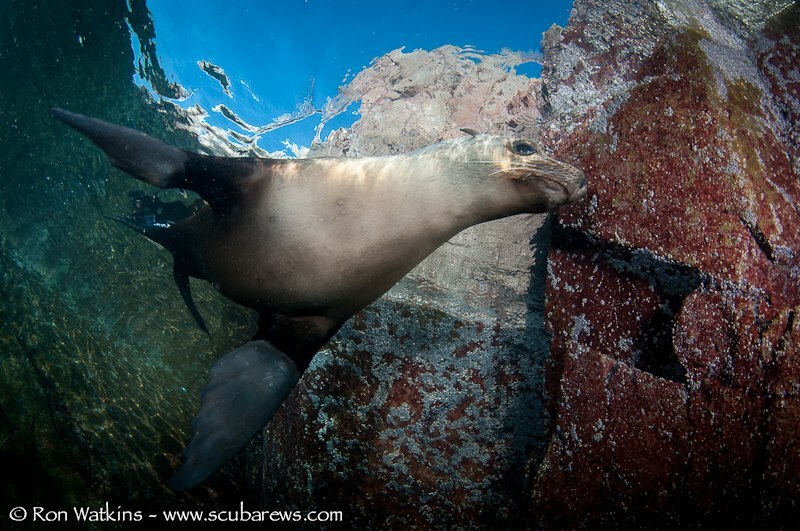 We had several more playful sea lion dives. We dove a couple of macro sites that had giant jaw fish at them. These guys are huge! They are about a foot long and as thick as a baseball. Snorkelers approaching a Sperm Whale. Unfortunately the Sperm whale soon descended. Typically we give a photo talk each night on our workshop trips, but on this trip we did several lengthy night dives that ate into our workshop time. We still had a lot of opportunities to do one on one sessions and small group discussions during travel time between sites. Some of the topics we covered were strobe lighting, slow shutter techniques and organizing and editing images in Lightroom. 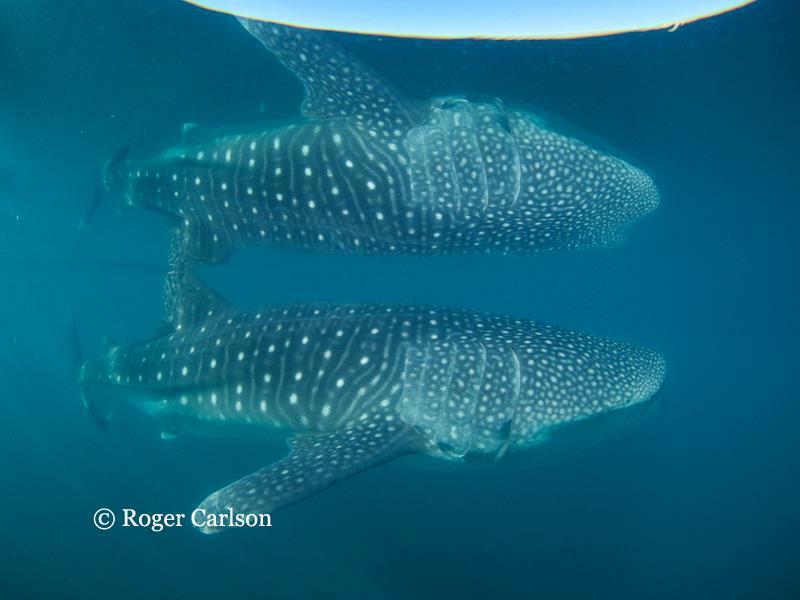 Whale Sharks, whale sharks, whale sharks! On our last day and a half, we went to the Bay of Los Angeles. 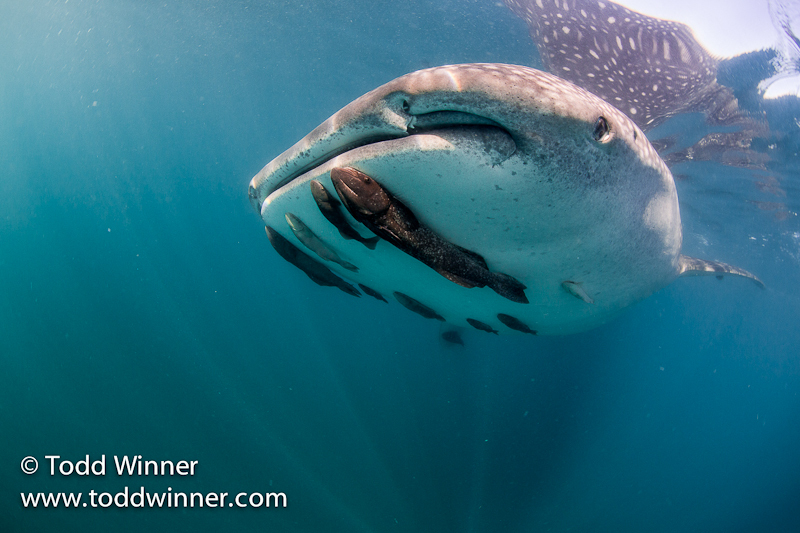 which is known for whale sharks. When we arrived there, we were not disappointed. 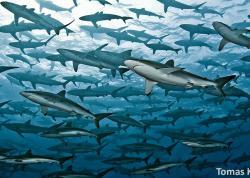 At one point we counted nine sharks in the water at once! They ranged in size from a 12 foot juvenile up to the 30 foot adults. These gentle creatures spend most of their time slowly swimming at the surface collecting plankton in their ginormous mouths. It still requires a bit of effort to kick along side of them, but we had so many opportunities and got some beautiful images. Everyone agreed this was the highlight of the trip. 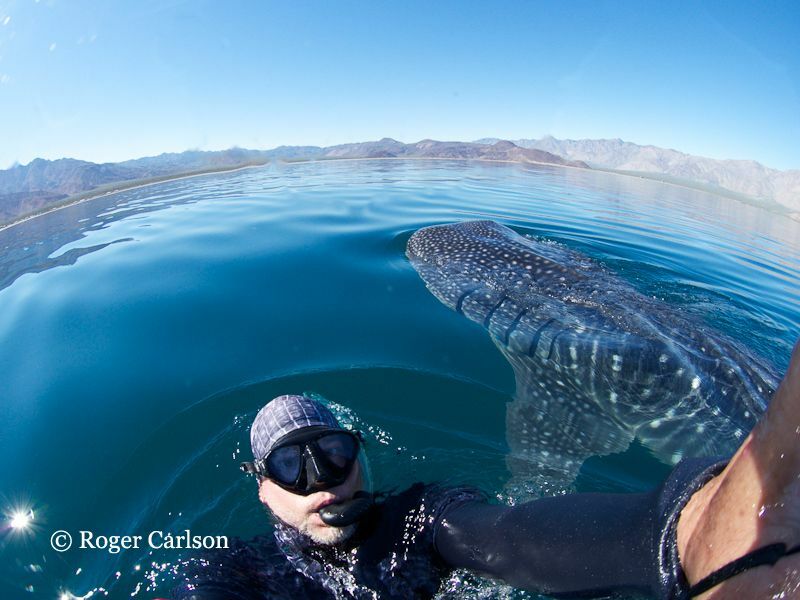 Unlike most Rocio del mar trips that only spend a couple hours with the whale sharks, we spend two days with them. Sharks - The most fun I've ever had! The Sea of Cortez continues to be one of my favorite locations for big marine animals, and this year proved to be a great macro location as well. The workshops are an excellent place to dive with like-minded people and learn a few things along the way. Please join Bluewater Photo on one of our other exciting photo workshops for your own awesome images. 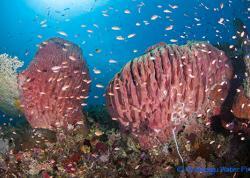 Equipment: Nikon D300 in Sea & Sea Housing with Dual S&S YS250 strobes, Tokika 10-17 lens. Settings: Zoomed in to 17mm, F10, 1/250 sec. 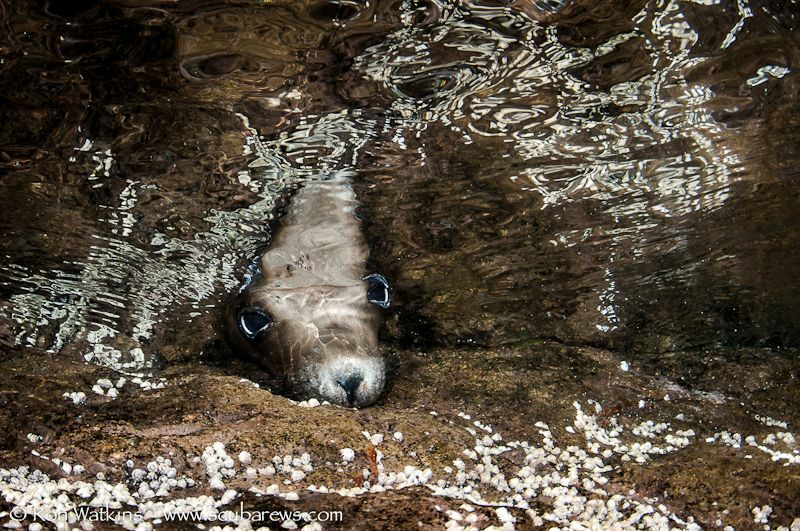 About the shot: I was attempting to do an over/under shot of this sea lion pup resting on a rock above water. After going under to readjust camera settings a few times, I noticed the pup was curious and sticking his head under water to see what I was doing. So I seized the opportunity and took a series of photos of her peeking at me. 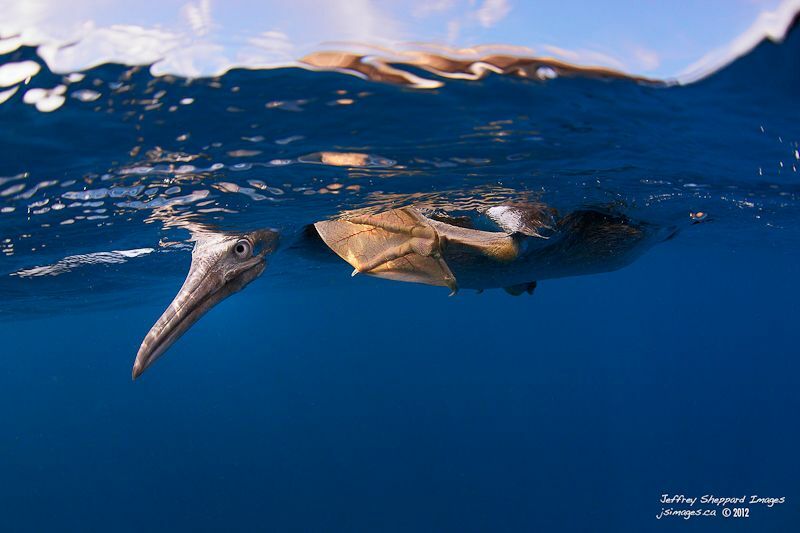 About the shot: The sperm whales didn't want to play, but this brown boobie was curious and kept looking underwater to see what I was doing. Out of the water my go-to birding lens is a 600mm f/4, but I was able to get close enough here to use a 15mm fisheye to capture full frame images. 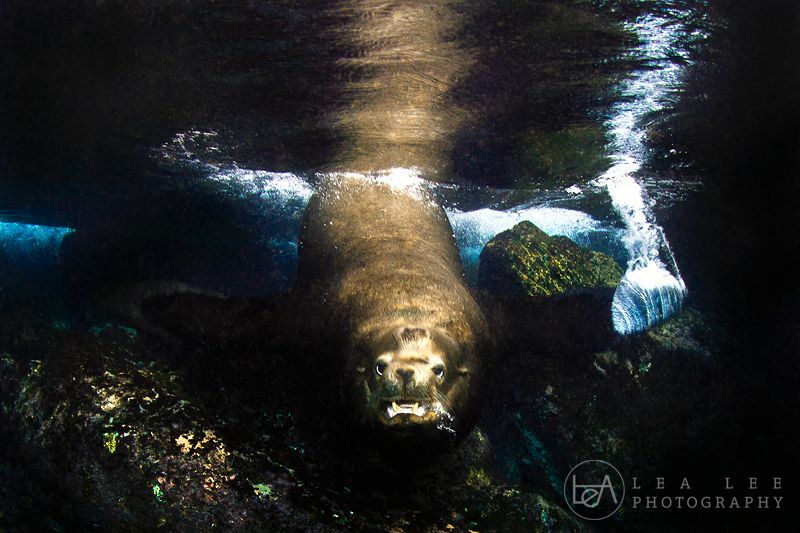 About the shot: This bull sea lion was hanging around me and I tried to take as many shots as I could, which wasn't so easy. he was biger tan me and I was quite scared when he approached me. It's a lucky shot and I have no idea how I took it to be honest. About the shot: We swam together for over an hour, covering the whole bay. No one else around. We'd swim pretty fast where plankton was thin, then stop and vacuum where it was thick. From time to time I'd pick my head up and look around to see where I was. There were times I practically swam into the boat, there were times I couldn't see the boat. Beat of all, it let me stay on the well-lit side. With the flat water, it was really peaceful. It's one of the best times I've ever had in the ocean, and that photo captures it. 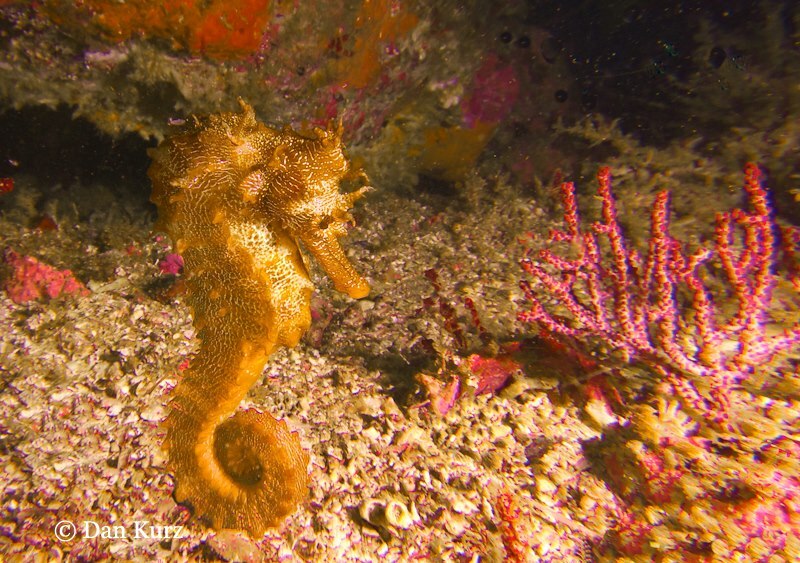 About the shot: I found a seahorse and took several pictures, correcting strobes until I got one that was good enough. I don't like to take too many shots of a seahorse as lights are bad for their eyes - they can't blink. 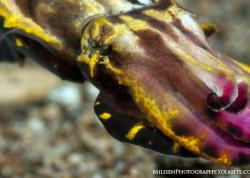 About the Shot: I discovered on this dive that the lens was set on manual focus not auto, thus I had to move in and out (bodily) to find the focus point. 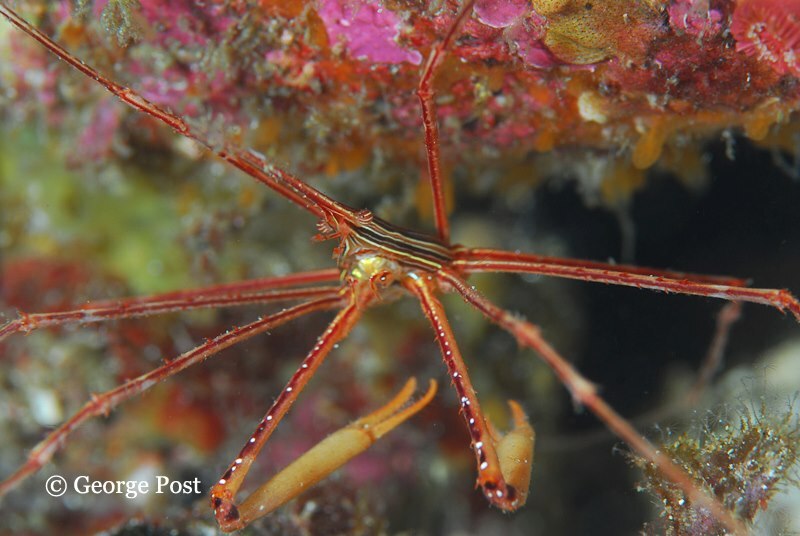 Fortunately, the focus point was at a distance which was ideal for the small critter subjects, such as this arrowcrab. 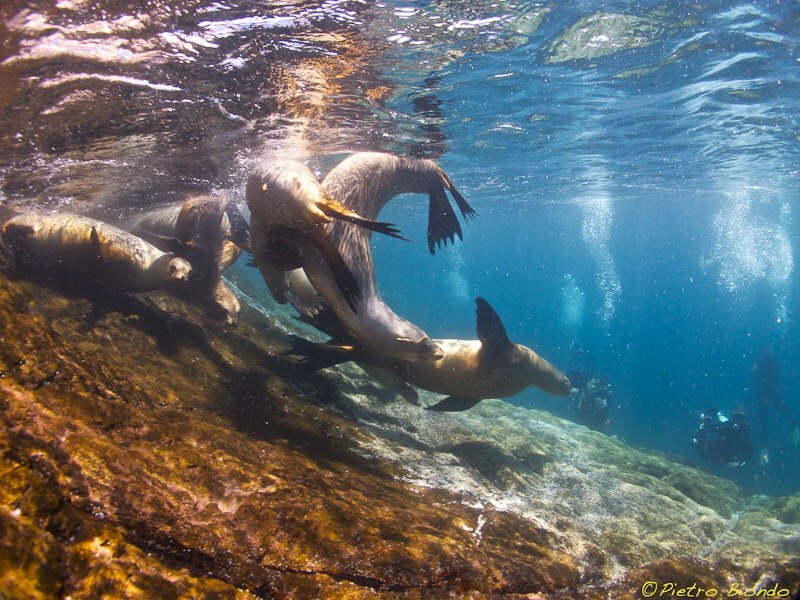 Join us on the July 2013 Sea of Cortez trip! Todd Winner is the technique editor for Underwater Photography Guide and an instructor and trip leader for Bluewater Photo Store in Santa Monica, CA. You can see more of his work at www.toddwinner.com.